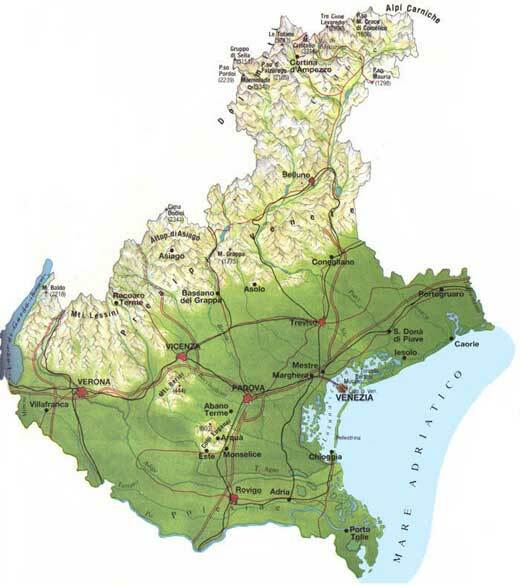 Territory: The region includes the eastern part of the Po Valley and, to the north, a part of the Dolomites. The extensive plain, with the Po delta, is rich in waters. It is a region which combines two different and unique aspects of the Italian nature: the lagoon zone (Venice) and the majestic peaks of the Dolomites of Cadore. Art: In the region numerous and important Roman traces can be found: the best known example is the Arena of Verona. In the area around Venice, Byzantine influences are visible (St. Mark and the Cathedral of Torcello); in the hinterland, away from the sea there are many outstanding examples of Romanesque and Gothic art. The Renaissance palaces are numerous and of great value. Museums: In Venice: the Academy Galleries house the major collections of Venetian painting from 1300 to 1700; the G. Franchetti Gallery houses important paintings, while Guggenheim collection exhibits international works of contemporary art. In the Palazzo Grassi, exhibitions of international interest are organized every year. In this beautiful city there are also: the Museum of the eighteenth century life in Venice with tapestries, attire, furniture and paintings; the National Gallery of Modern Art, the Oriental Museum and the Correr Museum, which is reserved to Renaissance masterpieces. In Verona the Civic Museum of Art, which is devoted to the great Verona painting, the Archaeologic Museum and the Museum of Frescoes can be visited. Vicenza offers: the Civic Museum (ethnology and archaeology) and the Pinacoteca. In Padua the famous Scrovegni Chapel, with Giotto�s frescoes, can be admired; the Civic Museum and the botanic garden, the oldest in Europe, can be admired. In Treviso there is the Museum of the Casa Trevigiana with modern furniture and sculptures. Rovigo has the Gallery of the Concordi (Venetian school from the fifteenth to the eighteenth century) and the Civic Museum of the Polesine Civilization. 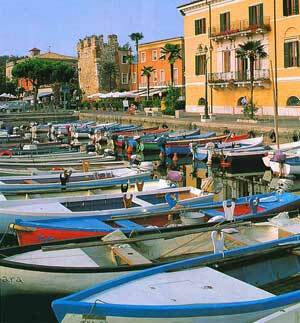 To be visited: The Venetian islands of Murano, Burano and Torcello; Chioggia; the canals of the Brenta and the Veneto villas. Visitors can admire the enchanting and unique lagoon and the majestic reddish spires of the Dolomites.